As Seen in Astronomy Magazine | Where is Yvette? 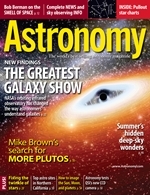 I just accomplished an old dream of mine: I went to my local bookstore, found the July 2011 Astronomy magazine on the rack, and purchased a copy that has an article written by me in it. Just like that. Ok, well not quite just like that- I sent the query article about a year ago, had to write and then do some changes on the thing, and then paid attention to other things until my parents wrote to me a few weeks ago saying a few issues of Astronomy and a rather nice check had arrived at their house (the issues were unfortunately waterlogged a little en route hence me buying new ones, but I would’ve wanted to go buy one myself anyway for novelty purposes). But for someone who read the magazine religiously as a young teenager- seriously, they fell apart!- it’s honestly jarring to look at my own words there and how professional they look. Strange thing to quip, it’s not like I want a hundred thousand people to read something that looked bad, but I suppose this is the advantage of editors who know better than you. This entry was posted in California, Science!, Writing. Bookmark the permalink. Big mistake by ASTRONOMY magazine! “California’s Top Astronomy Sites” should have been on the cover page!